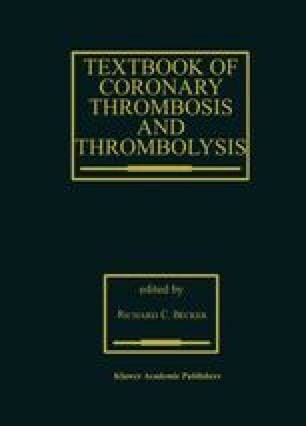 The prevention and treatment of intracoronary thrombosis has assumed greater priority as our understanding of the pathogenesis of ischemic heart disease has increased [1,2]. The appearance of layered thrombi in healed and acute coronary plaques implies that recurrent fissuring and thrombosis lead to plaque growth and fibrosis [3, 4, 5, 6, 7]. Platelet-derived growth factors contribute to the cellular response by inducing neointimal proliferation [8,9]. Platelet deposition and thrombus formation at the site of plaque disruption are basic to atherosclerotic progression and eventual occlusion, with thrombosis at the site of atherosclerotic plaque rupture being the fundamental step in the acute coronary syndromes of unstable angina (UA) and acute myocardial infarction (AMI). Fresh thrombi in these lesions have been confirmed by angioscopic, angiographic, and histologic studies [[8,9,10, 11, 12, 13]. While thrombolytic agents restore complete arterial patency (Thrombolysis in Myocardial Infarction [TIMI] grade 3 flow) in up to 54% of patients at 90 minutes, residual thrombus and ongoing thrombin generation and platelet activation contribute to vessel reocclusion and subsequently increase myocardial dysfunction and mortality [14, 15, 16, 17, 18, 19, 20, 21, 22, 23, 24, 25, 26, 27].